An understanding of the fundamentals of virus structure, genetics, and replication is critical to virologists and other forensic investigators attempting to identify potential biogenic pathogens that may be exploited as agents in biological warfare or by bioterrorists. Viruses are essentially nonliving repositories of nucleic acid that require the presence of a living prokaryotic or eukaryotic cell for the replication of the nucleic acid. There are a number of different viruses that challenge the human immune system and that may produce disease in humans. In general, a virus is a small, infectious agent that consists of a core of genetic material (either deoxyribonucleic acid [DNA] or ribonucleic acid [RNA]) surrounded by a shell of protein. All viruses share the need for a host in order to replicate their deoxyribonucleic acid (DNA) or ribonucleic acid (RNA). The virus commandeers the host's existing molecules for the nucleic acid replication process. There are a number of different viruses. The differences include the disease symptoms they cause, their antigenic composition, type of nucleic acid residing in the virus particle, the way the nucleic acid is arranged, the shape of the virus, and the fate of the replicated DNA. These differences are used to classify the viruses and have often been the basis on which the various types of viruses were named. Virology, viral classification, types of viruses. Virology is the discipline of microbiology that is concerned with the study of viruses. Viruses can exist in a variety of hosts. Viruses can infect animals (including humans), plants, fungi, birds, aquatic organisms, protozoa, bacteria, and insects. Some viruses are able to infect several of these hosts, while other viruses are exclusive to one host. 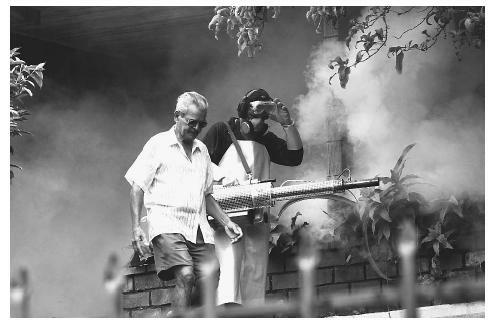 A man leaves his house while it is fumigated for mosquitos in Costa Rica in an effort to stop a 2002 outbreak of Dengue fever, whose viral hemorrhagic variety can be fatal if not immediately treated. and Strain/type. To use an example, the virus that was responsible for an outbreak of Ebola hemorrhagic fever in a region of Africa called Kikwit is classified as Order Mononegavirales, Family Filoviridae, Genus Filovirus , and Species Ebola virus Zaire. In the viral classification scheme, all families end in the suffix viridae , for example Picornaviridae. Genera have the suffix virus . For example, in the family Picornaviridae there are five genera: enterovirus, cardiovirus, rhinovirus, apthovirus, and hepatovirus. The names of the genera typically derive from the preferred location of the virus in the body (for those viral genera that infect humans). As examples, rhinovirus is localized in the nasal and throat passages, and hepatovirus is localized in the liver. Finally, within each genera there can be several species. There are a number of criteria by which members of one grouping of viruses can be distinguished from those in another group. For the purposes of classification, however, three criteria are paramount. These criteria are the host organism or organisms that the virus utilizes, the shape of the virus particle, and the type and arrangement of the viral nucleic acid. An important means of classifying viruses concerns the type and arrangement of nucleic acid in the virus particle. Some viruses have two strands of DNA, analogous to the double helix of DNA that is present in prokaryotes such as bacteria and in eukaryotic cells. Some viruses, such as the Adenoviruses, replicate in the nucleus of the host using the replication machinery of the host. Other viruses, such as the Poxviruses, do not integrate in the host genome, but replicate in the cytoplasm of the host. Another example of a double-stranded DNA virus are the Herpesviruses. Other viruses only have a single strand of DNA. An example is the Parvoviruses. Viruses such as the Parvoviruses replicate their DNA in the host's nucleus. The replication involves the formation of what is termed a negative-sense strand of DNA, which is a blueprint for the subsequent formation of the RNA and DNA used to manufacture the new virus particles. The genome of other viruses, such as Reoviruses and Birnaviruses, is comprised of double-stranded RNA. Portions of the RNA function independently in the production of a number of so-called messenger RNAs, each of which produces a protein that is used in the production of new viruses. Still other viruses contain a single strand of RNA. In some of the single-stranded RNA viruses, such as Picornaviruses, Togaviruses, and the Hepatitis A virus, the RNA is read in a direction that is termed "+ sense." The sense strand is used to make the protein products that form the new virus particles. Other single-stranded RNA viruses contain what is termed a negative-sense strand. Examples are the Orthomyxoviruses and the Rhabdoviruses. The negative strand is the blueprint for the formation of the messenger RNAs that are required for production of the various viral proteins. Still another group of viruses have + sense RNA that is used to make a DNA intermediate. The intermediate is used to manufacture the RNA that is eventually packaged into the new virus particles. The main example is the Retroviruses (e.g. the Human Immunodeficiency viruses). Finally, a group of viruses consist of double-stranded DNA that is used to produce a RNA intermediate. An example is the Hepadnaviruses. An aspect of virology is the identification of viruses. Often, the diagnosis of a viral illness relies, at least initially, on the visual detection of the virus. For this analysis, samples are prepared for electron microscopy using a technique called negative staining, which highlights surface detail of the virus particles. For this analysis, the shape of the virus is an important feature. A particular virus will have a particular shape. For example, viruses that specifically infect bacteria, the socalled bacteriophages, look similar to the Apollo lunar lander (LEM spacecraft). A head region containing the nucleic acid is supported on a number of spider-like legs. Upon encountering a suitable bacterial surface, the virus acts like a syringe, to introduce the nucleic acid into the cytoplasm of the bacterium. Other viruses have different shapes. These include spheres, ovals, worm-like forms, and even irregular (pleomorphic) arrangements. Some viruses, such as the influenza virus, have projections sticking out from the surface of the virus. These are crucial to the infectious process. As new species of eukaryotic and prokaryotic organisms are discovered, no doubt the list of viral species will continue to grow. Viral genetics. Viral genetics, the study of the genetic mechanisms that operate during the life cycle of viruses, utilizes biophysical, biological, and genetic analyses to study the viral genome and its variation. The virus genome consists of only one type of nucleic acid, which could be a single or double stranded DNA or RNA. Single stranded RNA viruses could contain positive-sense (+RNA), which serves directly as mRNA or negative-sense RNA (−RNA) that must use an RNA polymerase to synthesize a complementary positive strand to serve as mRNA. Viruses are obligate parasites that are completely dependant on the host cell for the replication and transcription of their genomes as well as the translation of the mRNA transcripts into proteins. Viral proteins usually have a structural function, making up a shell around the genome, but may contain some enzymes that are necessary for the virus replication and life cycle in the host cell. Both bacterial virus (bacteriophages) and animal viruses play an important role as tools in molecular and cellular biology research. Viruses are classified in two families depending on whether they have RNA or DNA genomes and whether these genomes are double or single stranded. Further subdivision into types takes into account whether the genome consists of a single RNA molecule or many molecules as in the case of segmented viruses. Four types of bacteriophages are widely used in biochemical and genetic research. These are the T phages, the temperate phages typified by bacteriophage lambda, the small DNA phages like M13, and the RNA phages. Animal viruses are subdivided in many classes and types. Class I viruses contain a single molecule of double stranded DNA and are exemplified by adenovirus, simian virus 40 (SV 40), herpes viruses and human papillomaviruses. Class II viruses are also called parvoviruses and are made of single stranded DNA that is copied in to double stranded DNA before transcription in the host cell. Class III viruses are double stranded RNA viruses that have segmented genomes which means that they contain 10–12 separate double stranded RNA molecules. The negative strands serve as template for mRNA synthesis. Class IV viruses, typified by poliovirus, have single plus strand genomic RNA that serves as the mRNA. Class V viruses contain a single negative strand RNA which serves as the template for the production of mRNA by specific virus enzymes. Class VI viruses are also known as retroviruses and contain double stranded RNA genome. These viruses have an enzyme called reverse transcriptase that can both copy minus strand DNA from genomic RNA catalyze the synthesis of a complementary plus DNA strand. The resulting double stranded DNA is integrated in the host chromosome and is transcribed by the host own machinery. The resulting transcripts are either used to synthesize proteins or produce new viral particles. These new viruses are released by budding, usually without killing the host cell. Both HIV and HTLV viruses belong to this class of viruses. Mutations in the virus genome could either occur spontaneously or be induced by physical and chemical means. Spontaneous mutations that arise naturally as a result of viral replication are either due to a defect in the genome replication machinery or to the incorporation of an analogous base instead of the normal one. Induced virus mutants are obtained by either using chemical mutants like nitrous oxide that acts directly on bases and modify them or by incorporating already modified bases in the virus genome by adding these bases as substrates during virus replication. Physical agents such as ultraviolet light and x rays can also be used in inducing mutations. Genotypically, the induced mutations are usually point mutations, deletions, and rarely insertions. The phenotype of the induced mutants is usually varied. Some mutants are conditional lethal mutants. These could differ from the wild type virus by being sensitive to high or low temperature. A low temperature mutant would for example grow at 31°C but not at 38°, while the wild type will grow at both temperatures. A mutant could also be obtained that grows better at elevated temperatures than the wild type virus. These mutants are called hot mutants and may be more dangerous for the host because fever, which usually slows the growth of wild type virus, is ineffective in controlling them. Other mutants that are usually generated are those that show drug resistance, enzyme deficiency or an altered pathogenicity or host range. Some of these mutants cause milder symptoms compared to the parental virulent virus and usually have potential in vaccine development as exemplified by some types of influenza vaccines. Besides mutation, new genetic variants of viruses also arise through exchange of genetic material by recombination and reassortment. Classical recombination involves breaking of covalent bonds within the virus nucleic acid and exchange of some DNA segments followed by rejoining of the DNA break. This type of recombination is almost exclusively reserved to DNA viruses and retroviruses. RNA viruses that do not have a DNA phase rarely use this mechanism. Recombination usually enables a virus to pick up genetic material from similar viruses and even from unrelated viruses and the eukaryotic host cells. Exchange of genetic material with the host is especially common with retroviruses. Reassortment is a non-classical kind of recombination that occurs if two variants of a segmented virus infect the same cell. The resulting progeny virions may get some segments from one parent and some from the other. All known segmented virus that infect humans are RNA viruses. The process of reassortment is very efficient in the exchange of genetic material and is used in the generation of viral vaccines especially in the case of influenza live vaccines. The ability of viruses to exchange genetic information through recombination is the basis for virus-based vectors in recombinant DNA technology and hold great promises in the development of gene therapy. Viruses are attractive as vectors in gene therapy because they can be targeted to specific tissues in the organs that the virus usually infect and because viruses do not need special chemical reagents called transfectants that are used to target a plasmid vector to the genome of the host. Genetic variants generated through mutations, recombination or reassortment could interact with each other if they infected the same host cell and prevent the appearance of any phenotype. This phenomenon, where each mutant provide the missing function of the other while both are still genotypically mutant, is known as complementation. It is used as an efficient tool to determine if mutations are in a unique or in different genes and to reveal the minimum number of genes affecting a function. Temperature sensitive mutants that have the same mutation in the same gene will for example not be able to complement each other. It is important to distinguish complementation from multiplicity reactivation where a higher dose of inactivated mutants will be reactivated and infect a cell because these inactivated viruses cooperate in a poorly understood process. This reactivation probably involves both a complementation step that allows defective viruses to replicate and a recombination step resulting in new genotypes and sometimes regeneration of the wild type. The viruses that need complementation to achieve an infectious cycle are usually referred to as defective mutants and the complementing virus is the helper virus. In some cases, the defective virus may interfere with and reduce the infectivity of the helper virus by competing with it for some factors that are involved in the viral life cycle. These defective viruses called "defective interfering" are sometimes involved in modulating natural infections. Different wild type viruses that infect the same cell may exchange coat components without any exchange of genetic material. This phenomenon, known as phenotypic mixing is usually restricted to related viruses and may change both the morphology of the packaged virus and the tropism or tissue specificity of these infectious agents. Virus replication. Viral replication refers to the means by which virus particles make new copies of themselves. Although precise mechanisms vary, viruses cause disease by infecting a host cell and commandeering the host cell's synthetic capabilities to produce more viruses. The newly made viruses then leave the host cell, sometimes killing it in the process, and proceed to infect other cells within the host. Viruses cannot replicate by themselves. They require the participation of the replication equipment of the host cell that they infect in order to replicate. The molecular means by which this replication takes place varies, depending upon the type of virus. Viral replication can be divided up into three phases: initiation, replication, and release. The initiation phase occurs when the virus particle attaches to the surface of the host cell, penetrates into the cell and undergoes a process known as uncoating, where the viral genetic material is released from the virus into the host cell's cytoplasm. The attachment typically involves the recognition of some host surface molecules by a corresponding molecule on the surface of the virus. These two molecules can associate tightly with one another, binding the virus particle to the surface. A well-studied example is the haemagglutinin receptor of the influenzae virus. The receptors of many other viruses have also been characterized. A virus particle may have more than one receptor molecule, to permit the recognition of different host molecules, or of different regions of a single host molecule. The molecules on the host surface that are recognized tend to be those that are known as glycoproteins. For example, the human immunodeficiency virus recognizes a host glycoprotein called CD4. Cells lacking CD4 cannot, for example, bind the HIV particle. Penetration of the bound virus into the host interior requires energy. Accordingly, penetration is an active step, not a passive process. The penetration process can occur by several means. For some viruses, the entire particle is engulfed by a membrane-enclosed bag produced by the host (a vesicle) and is drawn into the cell. This process is called endocytosis. Polio virus and orthomyxovirus enters a cell via this route. A second method of penetration involves the fusion of the viral membrane with the host membrane. Then the viral contents are directly released into the host. HIV, paramyxoviruses, and herpes viruses use this route. Finally, but more rarely, a virus particle can be transported across the host membrane. For example, poliovirus can cause the formation of a pore through the host membrane. The viral DNA is then released into the pore and passes across to the inside of the host cell. Once inside the host, the viruses that have entered via endocytosis or transport across the host membrane need to release their genetic material. With poxvirus, viral proteins made after the entry of the virus into the host are needed for uncoating. Other viruses, such as adenoviruses, herpesviruses, and papovaviruses associate with the host membrane that surrounds the nucleus prior to uncoating. They are guided to the nuclear membrane by the presence of so-called nuclear localization signals, which are highly charged viral proteins. The viral genetic material then enters the nucleus via pores in the membrane. The precise molecular details of this process remains unclear for many viruses. For animal viruses, the uncoating phase is also referred to as the eclipse phase. No infectious virus particles can be detected during that 10 to 12 hour period of time. In the replication, or synthetic, phase the viral genetic material is converted to deoxyribonucleic acid (DNA), if the material originally present in the viral particle is ribonucleic acid (RNA). This so-called reverse transcription process needs to occur in retroviruses, such as HIV. The DNA is imported into the host nucleus where the production of new DNA, RNA, and protein can occur. The replication phase varies greatly from virus type to virus type. However, in general, proteins are manufactured to ensure that the cell's replication machinery is harnessed to permit replication of the viral genetic material, to ensure that this replication of the genetic material does indeed occur, and to ensure that this newly made material is properly packaged into new virus particles. Replication of the viral material can be a complicated process, with different stretches of the genetic material being transcribed simultaneously, with some of these gene products required for the transcription of other viral genes. Also replication can occur along a straight stretch of DNA, or when the DNA is circular (the so-called "rolling circle" form). RNA-containing viruses must also undergo a reverse transcription from DNA to RNA prior to packaging of the genetic material into the new virus particles. In the final stage, the viral particles are assembled and exit the host cell. The assembly process can involve helper proteins, made by the virus or the host. These are also called chaperones. Other viruses, such as tobacco mosaic virus, do not need these helper chaperones, as the proteins that form the building blocks of the new particles spontaneously self-assemble. In most cases, the assembly of viruses is symmetrical; that is, the structure is the same throughout the viral particle. For example, in the tobacco mosaic virus, the proteins constituents associate with each other at a slight angle, producing a symmetrical helix. Addition of more particles causes the helix to coil "upward" forming a particle. An exception to the symmetrical assembly is the bacteriophage. These viruses have a head region that is supported by legs that are very different in structure. Bacteriophage assembly is very highly coordinated, involving the separate manufacture of the component parts and the direct fitting together of the components in a sequential fashion. Release of viruses can occur by a process called budding. A membrane "bleb" containing the virus particle is formed at the surface of the cell and is pinched off. For herpes virus this is in fact how the viral membrane is acquired. In other words, the viral membrane is a host-derived membrane. Other viruses, such as bacteriophage, may burst the host cell, spewing out the many progeny virus particles. But many viruses do not adopt such a host destructive process, as it limits the time of an infection due to destruction of the host cells needed for future replication. Flint, S. J., et al. Principles of Virology: Molecular Biology, Pathogenesis, and Control. Washington: American Society for Microbiology, 1999. Richman, D. D., and R. J. Whitley. Clinical Virology. 2nd ed. Washington: American Society for Microbiology, 2002. Biology Pages. "Viruses." 2002. < http://www.ultranet.com/~jkimball/BiologyPages/V/Viruses.htm >l> (April 12, 2003).